An appointment with tradition: a lieutenant wriggles through the “promotion hoop”. 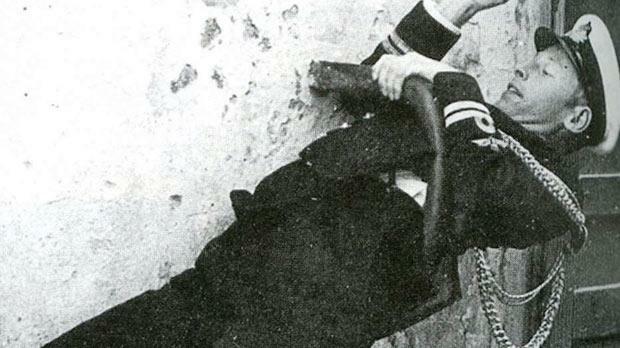 My letter The Story Behind The Hook (May 22) caught the attention of the secretary of The Royal Naval Association (Malta GC Branch), Elaine Zerafa, who promptly informed me that she had in her possession a photograph of a naval officer wriggling through the “promotion hook”. This photo appears in the excellent book written by Joseph Bonnici and Michael Cassar and entitled A Century Of the Royal Navy At Malta. It is also stated in this book that “tradition held that Nelson initiated this practice; officers who managed to wriggle through the hoop were assured of rapid promotion”. I hope that someone would provide us with some information regarding the other matter mentioned in my article, the Pillory.